Invited Commentary: Is Osseointegration a Foreign Body Reaction? Purpose: The aims of this study were to develop a French version of the Orofacial Esthetic Scale (OES) and to investigate its psychometric properties among French-speaking dental patients. 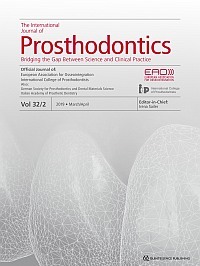 Materials and Methods: The OES is an eight-item instrument initially developed to assess self-reported orofacial esthetics in patients with prosthodontic concerns. The first seven items refer to direct esthetic impact and give a summary score, and the remaining item is a global assessment item. The original English version of the OES questionnaire was translated and cross-culturally adapted to develop a French version (OES-F). The reliability (internal consistency and test-retest reliability) and validity (convergent and discriminative) of the OES-F were then tested in a sample of 140 patients awaiting dental treatment. Results: Cronbach's alpha coefficients of the OES-F ranged from 0.885 to 0.913. The corrected item-total correlation coefficients ranged from 0.523 to 0.872. Intraclass correlation coefficient values were 0.94 (95% confidence interval [CI] 0.89 to 0.97) for the summary score and ranged between 0.85 (95% CI 0.73 to 0.92) and 0.90 (95% CI 0.81 to 0.94) for the items. OES-F summary scores assessed by patients were significantly correlated with experts' ratings (r = 0.51; P < .05). OES-F summary scores discriminated patients with esthetic concerns from those without esthetic concerns (P < .05). Conclusion: The OES-F questionnaire showed excellent psychometric properties and may be a suitable scale for assessing orofacial esthetics among French patients awaiting dental treatment. Purpose: To report implant failures in partially edentulous patients over a long-term period, focusing on differences in treatment outcomes between maxillary vs mandibular arches and different implant surfaces. Materials and Methods: Altogether, 2,453 patients were consecutively treated with 9,167 implants in 2,915 partially edentulous arches (Kennedy Class I or II) between 1986 and 2015 at one referral clinic. Implant failures were recorded on a routine basis at the clinic during follow-up, and the failures were analyzed with a focus on associations with treated arch and implant surface by means of a multivariable regression analysis. Results: Cumulative survival rates (CSRs) for arches provided with turned surface implants were 92.2%, 90.6%, 89.7%, and 88.3% after 5, 10, 15, and 25 years, respectively. Corresponding CSRs for arches provided with moderately rough surface implants were 95.7% and 95.2% after 5 and 10 years, respectively. Two individual surgeons and prosthetic treatment outside the referral clinic showed strong associations with early implant failure (P < .05). Implants with a turned surface showed an increased risk for failure early after surgery (< 1 year), but a comparable pattern of a reduced risk by time was present during the late period of follow-up (> 1 year) for both surface types. Variables associated with the number of implants per operation were associated with increased risk of implant failure for both implant surface types (P < .05). Conclusion: Individual surgeons seem to have an important impact on early risk of implant failure in combination with implant surface, number of placed implants, wide-platform implants, and treatment in the mandible. Observed differences in survival between different implant surfaces seem to be established early after surgery, but the risk during the following long-term period is reduced by time, and risk seems to be comparable for both surface types in both the maxilla and the mandible during maintenance. Purpose: To report and analyze long-term treatment outcomes in a patient cohort with severe periodontal disease treated with an employed protocol combining use of implants and double-crown prosthetic support. Materials and Methods: A convenience sample of 16 patients with generalized severe periodontal disease were prosthodontically managed with support from 83 dental implants and 21 removable prostheses using a double-crown concept (11 implant-tooth supported and 10 implant supported). Each patient was examined 2 to 4 weeks before scheduled teeth extraction and examined again following treatment completion at the time of insertion of the superstructures. Subsequent recall examinations were performed every 3 months over a 6- to 20-year period. Predetermined clinical parameters were recorded at each session, and intraoral radiographs were taken after insertion of the superstructure and at intervals of 1, 3, 5, 10, and 20 years. Results: No implant or tooth loss occurred during the individual observation periods. Mucositis was recorded around 65% of the implants and was accompanied by additional maxillary marginal bone loss around 27.7% of the implants. Mean marginal bone loss at implant sites after 5 years was 0.75 ± 0.66 mm, and after 20 years was 1.50 ± 1.45 mm. Moderate bone loss around teeth was registered after 5 years (2.8%) and 20 years (7.3%). No significant differences were found between implants in patients with tooth-implant- supported and those with implant-supported double-crown restorations. Conclusion: These results suggest that severely periodontally compromised patients can be successfully managed in the long term with the described clinical protocol. Purpose: To evaluate the feasibility and efficacy of a novel concept of early loaded (ie, within 2 weeks) implant-supported fixed dental prostheses (ISFDP) for patients who underwent mandibular reconstruction. Materials and Methods: All patients requiring mandibular reconstruction between July 2013 and March 2016 at AZ Sint-Jan Brugge-Oostende AV were screened for dental rehabilitation according to the proposed concept. Of 17 patients, 10 were eligible for inclusion. Clinical and radiologic assessments of implant integration and prosthetic survival were performed at 6, 12, 24, and 36 months. Patient satisfaction was assessed prior to and after prosthetic rehabilitation using the European Organisation for Research and Treatment of Cancer Quality of Life Questionnaires Core 30 and Head & Neck 35, as well as a visual analog scale. Results: Ten patients received mandibular reconstructive surgery for an oral cavity tumor (n = 6), osteoradionecrosis (n = 3), or medication-related osteonecrosis of the jaw (n = 1). Implants were placed within an average of 6 (2 to 21) months postsurgery in a one-stage procedure. Prosthetic rehabilitation was achieved within 2 weeks in 8 of the 10 patients. Two patients received their ISFDP delayed due to postoperative complications. Implant integration and prosthetic outcome at a maximum of 36 months of follow-up were successful in 7 of the 10 patients. At that time, two patients had passed away, while one patient had the ISFPD removed because of graft necrosis after radiotherapy. Patient satisfaction was high, with significant improvement after dental rehabilitation in comparison to mandibular reconstruction alone. Conclusion: The present concept offers a feasible and fast prosthetic rehabilitation that improves patient quality of life. Heierle, Linda / Wolleb, Karin / Hämmerle, Christoph H.F. / Wiedemeier, Daniel B. / Sailer, Irena / Thoma, Daniel S.
Purpose: To assess the biologic and technical responses to cemented and screw-retained all-ceramic singletooth implant-supported reconstructions at 3 years postinsertion. Materials and Methods: Thirty-four patients with single-tooth implants were randomly restored with either a cemented lithium disilicate crown on a customized zirconia abutment (CEM) or a screw-retained crown with a directly veneered zirconia abutment (SCREW). At baseline examination and after 3 years of loading, marginal bone level and technical parameters were assessed. Differences in marginal bone loss were tested using Mann-Whitney U test at baseline and at 3 years, and changes within each group between baseline and 3 years were tested using Wilcoxon signed rank test. Results: The median changes between baseline and the 3-year follow-up amounted to -0.1 mm (CEM; intragroup P = .36) and -0.0 mm (SCREW; intragroup P = .58). Intergroup comparisons did not reveal statistically significant differences at 3 years (P = .20) or over time (P = .70). Conclusion: At 3 years, screwretained and cemented reconstructions rendered largely the same radiographic and technical outcomes. Purpose: To assess the clinical performance of a prefabricated all-ceramic zirconium dioxide implant abutment for single-tooth replacement in the posterior region. Materials and Methods: Forty implants (Xive S plus screw type, Dentsply Sirona Implants) were inserted into the posterior region in 24 patients and were provided with zirconium dioxide abutments (Cercon abutment, Dentsply Sirona Implants). The licensed range of indications for these abutments is limited to the maxillary and mandibular anterior teeth. The following parameters were used to document the state of the soft tissue: modified Plaque Index; modified Sulcus Bleeding Index; and pocket depth. Mesial and distal bone levels were determined on radiographs during the prosthetic treatment and at the 5-year recall. Results: A total of 34 functioning implants were followed up over a 5-year interval. Two patients wearing three abutments were lost to follow-up. In total, five abutments exhibited a rotational misfit during the observation period, causing significant gingival discoloration and damage to the implants. In the remaining restorations, the soft and hard tissue parameters were indicative of a low inflammatory status. Compared to the baseline situation, partly significant bone apposition could be observed. Conclusion: The observed specific type of failures after 5 years in function for full zirconia posterior implant abutments cannot be recommended, at least not in combination with the implant system used in this study. Purpose: To compare the marginal vertical misfit between implant-supported frameworks fabricated using CAD/CAM systems and the conventional technique (lost-wax casting). Materials and Methods: This review was performed according to PRISMA criteria and registered on PROSPERO (CRD42017055685). An electronic search was performed independently by two examiners in the MEDLINE (Pubmed), Embase, Web of Science, and Cochrane Library databases to find studies published up to April 2018. Results: The database search yielded 507 references. After removing duplicate references, 384 studies remained. Eleven in vitro studies were selected according to the eligibility criteria (inter-reader κ = 0.88). Nine different CAD/CAM systems were used to fabricate 172 frameworks of different materials, including zirconia, monolithic lithium disilicate, and metallic alloys. Subgroup analyses were performed for different types and retention systems of the frameworks. In the general analysis, marginal misfit observed with the CAD/CAM systems was lower than with the conventional method (P = .003), as was observed in the subgroup analysis for single-unit frameworks (P < .00001). For fixed (P = .89), cemented (P = .60), and screwed (P = .18) frameworks, no significant difference was observed between the evaluated techniques. Conclusion: The CAD/CAM systems showed improved marginal fit over the conventional lost-wax casting technique for fabricating single-unit frameworks; however, in the subgroup analyses, no difference was observed for the fixed implant-supported type or for the retention systems evaluated. Purpose: To determine whether coating polymethyl methacrylate (PMMA) discs with Parylene-C would reduce Staphylococcus aureus and Candida albicans biofilm formation. Materials and Methods: MRSA and Candida albicans single and dual biofilms were grown for 48 hours in artificial saliva on parylene-C-coated or uncoated PMMA, and the viable biofilm colony-forming units were counted. Results: There was no significant difference in the count of viable methicillin-resistant Staphylococcus aureus or Candida albicans recovered from single- or dual-species biofilms between coated and uncoated PMMA discs. Conclusion: Parylene-C does not prevent biofilm formation on PMMA. Purpose: To experimentally examine the effectiveness of a small sample of commercial denture cleansers in removing Candida albicans cells from denture surfaces. Materials and Methods: A total of 216 specimens from three brands of denture base resins (72 for each acrylic resin) were divided into three groups of 24 specimens that each received a different surface treatment (Ra1, Ra2, and Ra3). The specimens were contaminated by the Candida albicans strain ATCC 90028, immersed for 15 minutes in one of two experimental denture cleanser solutions or in tap water, and placed in Petri dishes with culture medium. Results: Candida albicans colonies were measured after 24-hour incubation at 37°C. There was a statistically significant difference in the cleansing result depending on the denture cleanser used. Conclusion: The use of commercial denture cleansers may under certain conditions be effective in the removal of Candida albicans from denture bases. Carneiro, Vinícius C. / Siqueira, Caíque A. / Valentim, Flavia B. / Oliveira, Amanda L. E. / Oliveira, Matheus L. / Azeredo, Rogério A. / de-Azevedo-Vaz, Sergio L.
Purpose: To assess the accuracy of three cone beam computed tomography (CBCT) systems in misfit detection at the implant-abutment joint. Materials and Methods: A total of 32 implants were placed in dry human mandibles. Porcelain-fused-to-metal crowns, both with and without a 200-μm-thick gap at the implant-abutment joint, were placed and then scanned using three CBCT systems: Picasso Trio (PT), OP300 (OP), and Scanora 3D (SC). Images were assessed, and area under the receiver operating characteristic curve (Az) values were compared (a = .05). Results: Az values obtained with PT (0.86) were significantly higher than with OP (0.63) and SC (0.64) (P < .05). Conclusion: Images acquired with PT allowed for more accurate misfit detection at the implant-abutment joint due to higher contrast resolution. Purpose: To compare the load-bearing capacity after long-term use (5-year simulation) of posterior threeunit implant-supported fixed partial dentures (FPDs) fabricated with different esthetic materials. Materials and Methods: A total of 20 specimens fabricated from one design file using CAD/CAM were divided into four groups: polyetherketoneketone (PEKK) veneered with composite resin (CR); PEKK veneered with lithium disilicate (LD); zirconia veneered with fluorapatite (FA); and monolithic zirconia. Samples were placed into a chewing simulator with simultaneous thermocycling. The fracture load after aging was measured using the universal testing machine with load on the central fossa of the pontic. Results: FPDs fabricated with PEKK + LD had significantly higher fracture load (1,526.56 [SD 95.54] N) compared to PEKK + CR (1,069.54 [SD 67.94] N) (P < .05). FPDs fabricated with zirconia materials had significantly higher fracture load compared to PEKK materials (P < .05). There was no significant difference between monolithic zirconia and zirconia + FA (P > .05). Conclusion: FPDs fabricated with PEKK + LD were superior to PEKK + CR. These materials can be promising alternatives for use as implant-supported FPD materials in the high-stress- bearing posterior region. Zirconia + FA can be an alternative to monolithic zirconia in cases that require more esthetics. Purpose: To evaluate the fracture resistance and bond strength of cast posts and cores (CPCs) and customized glass fiber posts (CFPs) with self-adhesive luting. Materials and Methods: A total of 56 recently extracted premolars were divided into four groups for the fracture resistance test (CPC and CFP, with and without ferrule) and four groups for the bond strength test (CPC and CFP, immediate and 6 months of storage). Results: Differences for fracture resistance were found between CPCs and CFPs with ferrule. For bond strength, the interaction between post and root region was significant. Conclusion: Self-adhesive luting increased fracture resistance of CPCs with ferrule. The ferrule decreased root fractures. Bond strength was similar for both retainers but not for the apical third. Water storage affected bond strength positively. Walma, David A. Cruz / Seidenfaden, Julius C. / Mourad, Firas / Kase, Michael T.
Purpose: To describe prosthetic rehabilitation following partial rhinectomy with use of a novel retentive internal nasal keeper piece. Conclusion: The reported prosthesis utilizes a retentive mechanism not previously reported in the literature to maximize function and esthetics. This case history reports the treatment of a Caucasian woman in her mid-70s who was medically compromised and on anticoagulant medication. She presented with three lesions: the first was located in the mandibular buccal mucosa, extending into the regions of the mandibular left and right second premolars, the second in the maxillary right region, and the third in the junction between the hard and soft palates. Carbon dioxide laser therapy was chosen as a treatment modality and was utilized at a lower power setting of 1.62 W in a gated mode (50% on, 50% off) for excision of these lesions and for increasing the depth of the mandibular buccal vestibule. The average power was 0.81 W, and the spot area was 0.8 mm. In terms of pain, infection, and bleeding, minimal to no postoperative complications were reported, and better healing was observed within 2 weeks. Carbon dioxide laser therapy at a lower power setting is a minimally invasive tool that proved in the present case to have greater benefits in the management of oral soft tissue lesions in a medically compromised patient. Patients presenting both severe maxillary atrophy and dental malposition require a multidisciplinary treatment approach to achieve optimal esthetic and functional results. This case history report demonstrates how digital treatment planning and teeth set-up can serve as a reference for surgical, orthodontic, and prosthodontic procedures, leading to an all-ceramic full-arch implant-supported fixed prosthesis.